The Adonia String Trio offers elegant string music for weddings, banquets, corporate events, conferences, and other events in the Chattanooga area. We have been playing weddings here for over ten years. 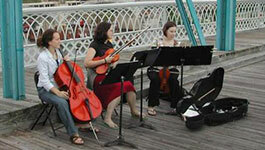 We are a flexible, professional group of musicians that will bring elegance and sparkle to your wedding or other event. Let Adonia make your event one to remember! The trio features three classically trained, professional musicians who have been playing together in Chattanooga for five years. 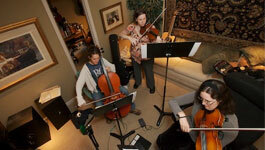 All three musicians are involved in the Chattanooga Symphony. We think you and your guests will enjoy our music, but you don't have to take our word for it...give us a listen! Read more about 10 and 10!